^ L, Klemen. Rear-Admiral Shoji Nishimura. Forgotten Campaign: The Dutch East Indies Campaign 1941–1942. 1999–2000. ^ Smith, Colin. 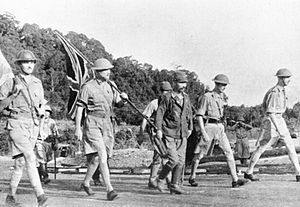 Singapore Burning: Heroism and Surrender in World War II. Penguin Group. 2006. ISBN 0-14-101036-3. Cull, Brian. Hurricanes Over Singapore: RAF, RNZAF and NEI Fighters in Action Against the Japanese Over the Island and the Netherlands East Indies, 1942. Grub Street Publishing. 2004. ISBN 978-1-904010-80-7.